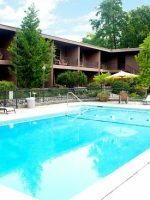 The Riverside Inn overlooks the Rogue River and is just a few blocks away from historic “G” St. in downtown Grants Pass for shopping and dining. 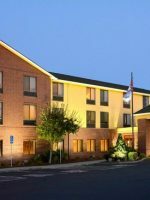 The hotel offers 63 guestrooms, each with a private balcony overlooking the river, free Wi-Fi and parking, a complimentary hot breakfast that goes beyond the usual fare, and an outdoor seasonal swimming pool. Room options include standard rooms, which are on the first or second floor, with one king or two queen beds, and deluxe rooms, which have the same bed configurations but are on the third floor. The Deluxe Riverfront Fireplace rooms have a stone fireplace and a king bed. All rooms come with a mini-fridge. Cribs, rollaway beds, and microwaves are available upon request. Children 12 and under stay free on most rate plans. Look for packages that include white water rafting. River excursions are available at Hellgate Jetboat Excursions right next door. Stayed here while visiting a friend. Kind of a paradox, very nice bed and updated bathroom and very clean yet the other furnishings seem sparse and slightly outdated. This doesn't take away from the comfort just seems a little odd. Very friendly staff and they have a good breakfast. All rooms have a great view of the river and the bridge. Very close by is Hellgate boat tours, which in season are an absolute must. I would definitely stay here again. Friendliest staff and great view! This was a last min getaway for my husband and I. We looked at a few different spots in Grants Pass. The Riverside Inn had a decent price, so we booked it. When we arrived until the time we left every single staff member we encountered were genuinely friendly. I mean not like they are paid to be nice to guest but just very nice people. Our room was on the 2nd floor which I don't mind (except for the person above us who kept walking back and forth, back and forth. There was a creek in the floor which at 7:00 am is a bit annoying). The view was so cool. Love seeing the wild waterfowl. The patio was relaxing to sit on, had 2 chairs and a small table ( bet during the summer is really nice). They have a nice looking pool behind the lobby (didn't get to take advantage of that due to Oregon's April weather). Didn't get any of the breakfast (slept in). The lobby has free coffee, water and adult beverages for purchase. Good location in town from food and other points of interest. Would love to come back with my family and stay a few more days to adventure around.